The entire world has caught Startup Fever. In cities and neighborhoods, states and provinces, and across entire countries, massive resources are pouring into efforts to support the creation and growth of startup companies. The word “startup” is appended to nearly anything, lending a patina of immediate goodness. The mania for Startup [Anything] might be easy to ridicule, but there is good reason for Startup Fever. Young, technology-based firms that seek growth and scale are important drivers of jobs, productivity, innovation, and economic growth. By many accountings, they're the main driver. Any region would be foolish not to try to foster a supportive startup ecosystem. Yet we continue to see the economic rewards from Startup Fever flow to only a small handful of places. Despite ever-increasing attempts to help startups in more places, many of those places aren’t seeing the economic benefits. Unfortunately, as with any mania, snake-oil purveyors have identified an opportunity to make a quick buck by selling wrongheaded approaches to cities and countries. "Just follow this simple blueprint," they whisper, "and you'll have a blossoming entrepreneurial ecosystem in no time." I categorize these approaches as fallacies of ecosystem development: the monoculture fallacy and the kitchen-sink fallacy (also known as the "more of everything problem" as described by my friend Ian Hathaway). We'll explore these fallacies in subsequent work but my guess is that several of you are familiar with these even without additional detail. In each of these metros, efforts are underway to support entrepreneurs, create more startups, and generate stronger economic trajectories. Like many other American cities (and elsewhere), they’ve been through economics ups and downs and now see startups as their next best hope for sustainable and broadly-shared growth. Through our ecosystem assessment, we established where in the Ecosystem Lifecycle they are, how they compare to other places, and what some key priorities might be for strengthening their ecosystems. Along the way, we learned a great deal about each area. Today, we're releasing a summary report of the research and findings, in partnership with Kauffman and local organizations in all six metros that helped us with data collection. Here are some highlights. Startup Output refers to the number of young, technology-based startups in an ecosystem. Each of these six metros is in the Early Activation phase of the Ecosystem Lifecycle, with relatively small populations of startups. In this group, Springfield (which covers a large part of the Pioneer Valley) has the highest Startup Output and Startup Density. At this phase of the Lifecycle, an important focus should be resource activation—drawing existing talent from corporations, small businesses, and universities into the startup ecosystem. Each ecosystem shows plenty of potential for growth. New Orleans and Albuquerque have strong Local Connectedness: meaningful relationships between founders and other stakeholders, high frequency of interaction, and supportive cultures among founders. Collisions—interactions with others in the startup community, including attendance at local events—are the vehicle for collaboration. More relationships—with founders, investors, and experts—are created with more collisions and as an ecosystem increases in size. On these measures of quantity, both New Orleans and Albuquerque not only outdo their peers here but also are in line with the global average across all ecosystems in our assessments. In fact, Albuquerque has the densest local networks in this analysis and outperforms the global average. But, the most important measure of Local Connectedness is more qualitative, what we call the Sense of Community. This captures the culture of giving and receiving help among founders, investors, and experts. Is help given without expectation of an immediate payoff? By this measure, New Orleans has the strongest startup culture among the six metros. Even at the earliest stages of ecosystem growth, it is important for startups to seek overseas customers: as several years of our research have established, startups that “go global” early in their journey enjoy faster revenue growth than those that remain focused on domestic markets. For startups in the United States, this can be difficult simply because we have such an extensive and well-developed home market. But, that doesn’t make Global Market Reach any less important for American startups. One way to increase Global Market Reach is by building Global Connectedness: meaningful relationships between founders across ecosystems. In particular, being connected with the world’s leading ecosystems helps import know-how, ambition, and awareness into an ecosystem. (See our article here for greater detail.) It is common, at the early Activation phase, to have low levels of Global Connectedness and Global Market Reach. That is what we find here. Importantly, what we measured so far is only connections between these six cities and the top global ecosystems (such as Silicon Valley, Tel Aviv, and Berlin). It is entirely possible, and quite likely, that startups in Fresno or Springfield have good connections to other ecosystems. 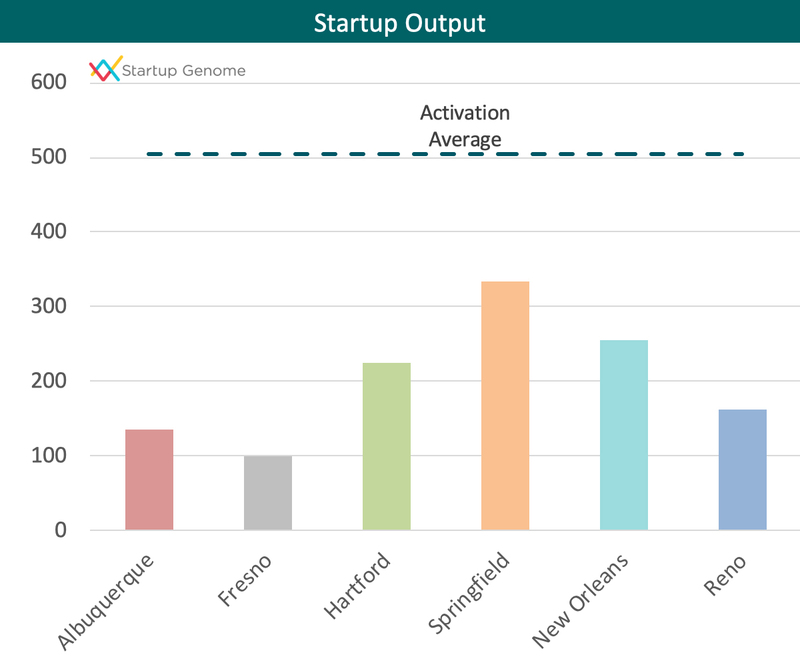 Surprisingly, startups in Springfield and Albuquerque sell to global markets at levels close to the average among all Activation phase ecosystems in the world, according to our analysis. On average, startups in Springfield and Albuquerque have 13 percent of their customers outside North America. As ecosystems grow and progress through the Ecosystem Lifecycle, they move from activating local resources to attracting them from elsewhere. Normally, Resource Attraction is negative for early-stage ecosystems: founders, capital, and potential employees depart for larger and more developed ecosystems. Nevertheless, that isn’t always the case. In the analysis of six metros here, Reno displays a strong gravitational pull for both existing startups and future entrepreneurs. In our data, nearly 14 percent of startups in Reno moved there from elsewhere, with many of them citing a lower cost of doing business as their reason for moving. 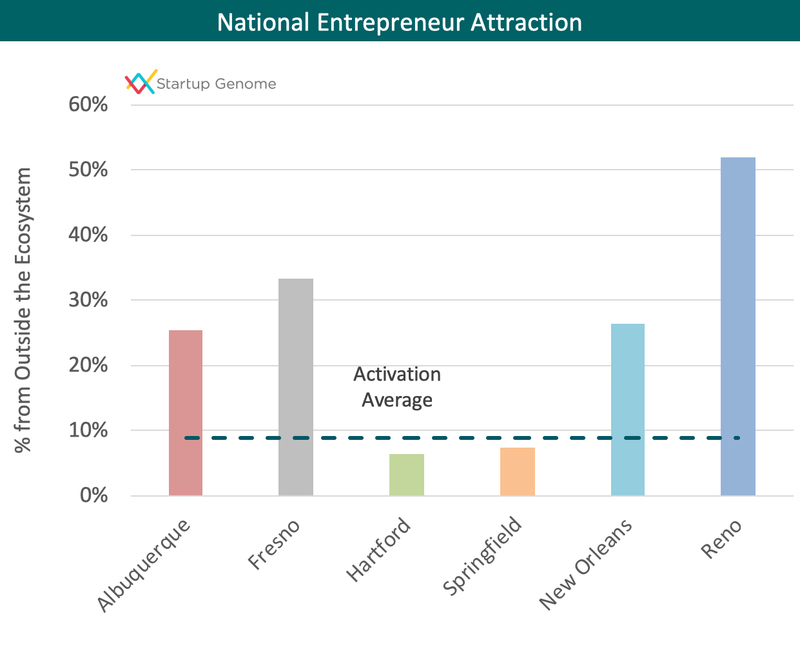 At the same time, Fresno exerts strong attraction for individuals who move and then become entrepreneurs: one-third of founders in Fresno moved there from somewhere else. Usually, they moved there for personal reasons (quality of life, cost of living). Once in Fresno, they got involved in the startup ecosystem and started companies. Founder Characteristics: Closing the Gaps? An important measure of startup ecosystems anywhere is how well their local organizations and programs are closing gaps and expanding inclusion. In many places, founders look alike or come from similar backgrounds, and there are significant barriers to greater participation from women and minorities. At Startup Genome, we’re developing with our Members a new Ecosystem Success Factor to measure Inclusion. The results of this will be ready in 2019. Thus far, we’ve collected basic demographic data for startup ecosystems. In general, U.S. startup ecosystems have higher shares of female founders than elsewhere, and these six metros are no exception. In Hartford, for example, nearly four in 10 founders are women, which is twice the global average across all ecosystems in our database. There is of course room for improvement everywhere, but relative to other startup ecosystems, these six are all above average on gender inclusion. Vibrant startup ecosystems really can be found anywhere. In New Orleans, where the memories and scars of Hurricane Katrina still loom over everything, new organizations have supported startups and, most impressively, cultivated a strong culture among founders. In Reno, which has lived in the shadow of Las Vegas and California, a distinct startup identity is emerging, marked especially by an influx of relocated startups. In California’s Central Valley, one of the breadbaskets of American agriculture, public and private leaders in Fresno know startups are key to their economic future. Efforts there focus on leveraging that agricultural expertise for greater startup and scaleup success in Agtech. In Springfield (MA), a seat of American innovation through the 19th and 20th centuries, the work of many regional organizations has clearly been paying off in terms of startup creation. I had the chance to visit Hartford several years ago and it’s quite clear that just in the span of a few years the startup scene has exploded. We didn’t conduct a sub-sector analysis for these ecosystems in the same way we do with our Members, but Hartford’s focus on leveraging regional expertise in insurance seems to have moved the needle on several variables. And in Albuquerque, site of the two greatest television shows ever made, I have had the pleasure to visit and get to know the dedicated work of many in the public and private sectors. The excitement around startups is palpable, particularly as regards the creative sectors and inclusion of many groups. Early-stage ecosystems need help. Despite the potential, it’s far from assured that the startup ecosystems in these cities—or anywhere else—will fulfill the promise of job creation and economic growth. Even in startup ecosystems that are at later phases of the Lifecycle, stagnation can and does happen. Ecosystems like the six profiled in our report don’t need “help” in the sense that existing players and stakeholders aren’t up to the task. But they need help avoiding the pitfalls of the kitchen-sink and monoculture fallacies. They need help from policymakers at the state and federal levels to remove barriers and perverse incentives that can hinder startups. And they need help figuring out how to focus and prioritize: every ecosystem builder we met is stretched to capacity. There’s simply too much to do and everyone faces resource constraints. So they need help—through better empirical analysis and connections with other places—to determine the best ways to maximize their scarce resources. Startup Fever will eventually break. All fevers do. When that day comes, when we simply can’t create another accelerator or university entrepreneurship program, when we’ve reached diminishing returns with new support services—where will your ecosystem be? Will the public and private resources you’ve invested simply disintegrate? Or will you have built something that endures, that is creating economic and social rewards that stay in your region? These are questions that everyone involved in helping entrepreneurs, startups, and ecosystems needs to answer. Thank you to all the local organizations in each city who assisted with data collection and provided their input and insight on each ecosystem. You can find all these organizations in the report itself.